– Feb 13th: There’s WHAT in Your Workfile? >> Slow? Get Busy: Work directly with clients, get paid full-fees and diversify your business. Click here to learn more. This story below is republished from Working RE (Volume 27, Spring 2011). Upcoming Webinar: There’s WHAT in Your Workfile? – Presented by Tim Andersen, MAI, M.Sc., CDEI; Get an expert’s insight into how to bulletproof your workfile from clients, your state appraisal board and others. Editor’s Note:What you don’t know about how state boards handle enforcement issues may surprise you. 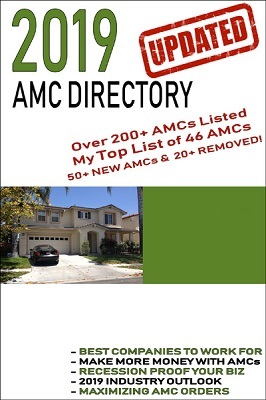 The website is public record, listing names, dates, certification numbers and so forth, as is common in most states (click to view). 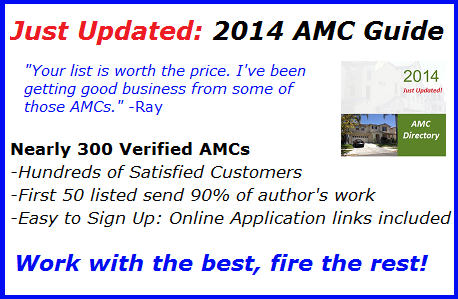 We have included summaries here with appraiser names redacted. What is important is not the respondents’ names but the charges laid against them, as well as the charges that are not. 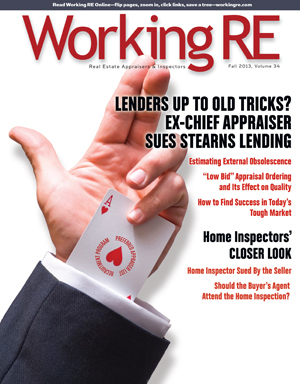 This issue is important to all appraisers no matter where they live. Consider Case #20080608591 (names redacted). Here, the state charges the appraiser with violation of the Departure Rule, as well as with “failure to exercise reasonable diligence,” whereby one charge becomes two. In Case #2009017685, the respondent’s workfile failed to contain “[the] documentation to support the adjustments and conclusions in the Sales Comparison and Cost Approach sections of the report,” which is by definition also a “failure to exercise reasonable diligence.” Again, one violation becomes two by an action no more complex that the stroke of a pen. In Case #2008047867, “failure to exercise reasonable diligence” includes a misstatement of the subject’s zoning (as if merely misstating the zoning was not enough, in and of itself, to justify a charge). Case #2009007431 illustrates the problem of charging an appraiser with “failure to exercise reasonable diligence”; the charge reads: “Respondent failed to reconcile the sales contract price of the Subject property with the opinion of value in the report. Respondent also had the incorrect depreciation amounts in [sic] the Cost Approach section of the report. Respondent’s work file [sic] lacked documentation to support the adjustments made in the Sales Comparison approach section of the report. Violation: guilty of having failed to exercise reasonable diligence in developing an appraisal report”; two charges become three. What is interesting is the state’s using “failure to exercise reasonable diligence” to convert an appraiser’s benign action, which is not a violation of statute or the Uniform Standards of Professional Practice (USPAP), into a malignant violation. For example, USPAP does not require the appraiser to “reconcile the sales contract price…with the opinion of value in the report” as the charge states. SR1-6, the reconciliation standard, puts reconciliation in the context of “data available and analyzed within the approaches used” and “the applicability of the approaches, methods and techniques used.” Clearly, if there is a sales contract, the appraiser should analyze it and explain why the final value opinion and the contract price vary (if they do). Nevertheless, USPAP does not specifically mention such reconciliation nor does Florida state statute. Yet with this added charge applied, the appraiser’s failure to take a step USPAP does not even require, this “violation,” is elevated to the same level as a violation of USPAP’s Ethics Rule. Inspection of the other cases the state closed in 2010 show that Florida equates “failure to exercise reasonable diligence” with numerous other violations, in addition to those this essay treats specifically. These additions are as diverse as improperly maintaining a workfile and/or failure to have within the workfile documentation of the derivation of adjustments2. The state also includes under this tent, the failure to include and/or calculate depreciation properly, as well as failure to reconcile discrepancies in data. This tent even includes a charge that the appraiser certified he completed the appraisal in compliance with USPAP, even though the state concluded this was not true. By contrast, were there any 2010 cases in which the appraiser did not “[fail] to exercise reasonable diligence”? In Case #2008052576, the charges against the appraiser state, “in June 2007, Respondent (name redacted) appraised a property in Apopka…relying exclusively on the developer’s sales office for data on the Subject Property [sic] and one Comparable Sale [sic], misstated the sales price for that Comparable Sale [sic] and failed to maintain in the workfile a fully executed copy of the sales contract for the Subject Property [sic].” Despite these omissions and commissions that prima facie seem as egregious as the others (supra), the state did not charge the appraiser with “failure to exercise reasonable diligence” in the preparation of that appraisal and report. Therefore, if an appraiser were to conclude that the state is not consistent in its charges and judgments, that conclusion would be difficult to refute from the data in the record. The state, as you might guess, is under no legal obligation to charge and judge equitably. If the state of Florida is a bellwether, and in matters such as these it usually is, it looks as if the states may be willing to negotiate away X-percent of the original set of charges against an appraiser but that the umbrella charge of “failure to exercise reasonable diligence” or something similar remains, even if there is only one substantive charge. While this term is clearly as ambiguous as the term “moral turpitude,” this is not enough to extinguish its use against appraisers by the states. What is at stake? When an E&O provider sees that an appraiser has been charged with “failure to exercise reasonable diligence,” red flags will go up and in some cases so will the appraiser’s E&O premium, even though the failure may have been a single one of a minor nature, requiring but a small state penalty. Also, if states do not uniformly apply the “failure to exercise reasonable diligence” charge, it leaves appraisers wondering under what circumstances failure to maintain a workfile properly is “failure to exercise reasonable diligence” and when such an omission is not. The appraiser has the burden of understanding his or her state statutes and administrative codes relative to real estate appraisal, their limitations on appraisers and how and when those limitations apply. Failure to understand the law will not protect appraisers from it. A common complaint is that USPAP is not enforced uniformly by the states. According to a recent story in Working RE (visit WorkingRE.com, Didn’t Make it to Print; The Appraisal Foundation Raising the Bar), the Appraisal Foundations (TAF) has the uniform enforcement of USPAP by the states on is priority list. The problem, however, is that each state is sovereign in the creation and enforcement of its laws, so the complaint of unequal enforcement is both true and irrelevant. While it is the appraiser’s job to conform him/herself to the law of the state(s) granting certification, it is not the job of the states to conform themselves to what other states are doing. The following is a true story: an appraiser certified in both states X and Y recently shared an anecdote about the lack of uniform enforcement between the two states in which he works. State X charged him with various violations and applied a sanction. Since most states have, as part of their certification law, verbiage that discipline in one state can trigger discipline in another state as well, this appraiser told the authorities in state Y of the sanction by state X. The authorities in state Y asked him to send in the charges, etc. from state X. He complied knowing full well that it could result in his being sanctioned in state Y also. After looking at the case, the certification officials in state Y told this appraiser that not only were they not charging him with any violation, but that their state would never have even opened a file given the evidence. So what got him charged and sanctioned in one state was innocuous to another. Another case (details in author’s possession) shows a western state sanctioning a residential appraiser for violation of the COMPETENCY RULE. In the offending appraisal report the appraiser disclosed s/he was “not a home inspector and only performed [sic] a visual inspection of the site and this appraisal cannot be relied upon to disclose conditions and or defects in the property.” This is a common disclosure many appraisers use daily so their clients and intended report users more completely understand the scope of what an appraiser does and cannot do as part of an appraisal. A Stipulation and Consent Order is a document where both parties involved (state and respondent) agree to all the material and statements in the order and which binds them both to its stipulations and conditions. The Order in this case states that the “[r]espondent [also] failed to disclose this lack of competency prior to acceptance of the assignment.” In other words, in this western state, an appraiser must also be a competent home inspector in order to be a competent real estate appraiser, according to the stipulation and consent in this Order. In another Stipulation and Consent order from the same state, its certification authorities found that the appraiser violated the ETHICS RULE. Here is the quote from the Order: “The original client was (Bank X) but this was changed to (Bank Y) by altering the statement of the intended user of the report without full disclosure of the original client or why a new user appeared, which is misleading.” The key is the phrase “without full disclosure of the original client.” If one looks over the ETHICS RULE one does not find anywhere any requirement that the appraiser must disclose who the client was on a previous appraisal assignment. Yet, by signing the Stipulation and Consent Order, this appraiser agrees that such a failure to disclose is a USPAP violation. Indeed, had the appraiser so disclosed, that would likely have violated the Confidentiality provision of this RULE! Thus, the state made the appraiser stipulate to an admission of breaking a rule that does not exist, as well as consent to a sanction for so doing. One more anecdote is in order, this from a metropolitan southern state. To quote the state, the appraiser “[v]iolated USPAP by misreporting a date signed on an appraisal and failing to maintain a copy of all communicated appraisal reports within the workfile.” The problem is that USPAP does not require an appraiser to maintain copies of all communicated appraisal reports within the workfile. USPAP merely requires appraisers to retain such copies. USPAP does not state where those copies must be retained nor does it make an issue of the medium on or by which the appraiser retains them. The appraiser merely must have them and be able to access them when and if the need arrives. For failing to do what USPAP does not require appraisers to do, this appraiser received a $750 civil penalty, as well as the requirements to take a 15-hour Site Valuation and Cost Approach course and a course in Residential Report Writing. Interesting sanctions for violating a rule that does not exist, aren’t they? The summaries here, which are not meant to be a scientific sampling of anything, show that the states are enforcing USPAP on a level more sophisticated and imaginative than most appraisers might expect. Since the only appeal to these state decisions is via the time-consuming and expensive circuit court, it behooves appraisers to be aware of these decisions and conform themselves to them. It is likely not necessary to maintain a five-inch pile of paper in a manila folder for every appraisal assignment that comes in the door. However, having one CD for every report, with copies of every scrap of paper the appraiser generated during the production of the report, is likely the only acceptable response to state actions such as these. The CDs must be kept in a safe, easily acceptable place. In addition, the appraiser must have the technology to reduce all of the contents of that CD to paper easily, should that be necessary. As for the states, don’t stand on one foot waiting for any changes from them. The Appraisal Sub Committee and The Appraisal Foundation look to the states to enforce their individual appraisal statutes in a timely and vigorous way. States are lauded for bringing charges against their appraisers and then clearing those charges from their books ASAP. Because of the states’ essentially unassailable power to sanction and punish, state Boards must do a better job distinguishing between those circumstances that require serious sanction and those where education and counsel are more suitable. 1This State charged the appraiser with the violation in 2008, but the violation took place in 2006 when the Departure Rule was still in effect. 2This, despite the fact that USPAP does not require the appraiser to adjust anything for any reason. Indeed, Standards One and Two do not even mention the word “adjustment” in any context. The words “adjustment” and “adjustments” do not appear until AO-16. New rules are leaving appraisers more exposed than ever to legal and regulatory complaints. Get an expert’s insight into how to bulletproof your workfile from clients, your state appraisal board and others. This webinar is designed to keep appraisers trouble free. It describes the new AQM process and what to expect from Fannie Mae (FNMA). I have been enduring an ongoing state investigation for over a year now, it has cost $50K + in lost business and attorney’s fees. The system is flawed and unfair. Set up to avoid the law and condemn any appraiser who has a complaint filed against them, no matter how ridiculous the claim. After 15+ years I am finishing this up and GETTING OUT of this wretched career. With every appraiser I know at the age of retirement, no one training new people and current appraisers being prosecuted for the most absurd reasons, taking years of their life and tens of thousands of dollars in losses there will be NO ONE left standing. Same fees now as 15 years ago, no benefits, no raises or promotions, no 401K. Too much liability to be unhappy and unappreciated. Good job feds, let the states make up the rules as they go and kill an entire workforce. I am very concerned about a licensure board who seems to have no regulations imposed upon themselves; there is no recourse for people who have been falsely accused. If they declare you are “in violation” of an OAR they can list four more subsections underneath which basically say the same thing; each one having a price tag. I agree with the person that stated that the accuser SHOULD be required to attend the hearing; even if the accused is not present; they should have to do more than “write a letter”. I worked very hard for my licensure; the people I care for; and out of so many years, one unfounded complaint is costing me my future, my reputation and it seems I have NO recourse. I have liability insurance; but was told they could not recommend a lawyer in my state. I have not found a lawyer who will fight the board; let alone one who will hear my case. If ANY one knows of a lawyer in Oregon that can take on the BLSW board Please contact me!!!! The allegation was made almost 4 years ago.. The board never completed their investigation; just stated that I they found me in violation; the allegation is completely unfounded. I was offered a really good job; but need to be credentialed; just the offense hanging over my head is very stressful. Thank you to anyone who may have some advice or can direct me to someone who can help. I would like to see that it is mandatory that people that complain be made to attend the board meeting. It seems to me that people can just file a complaint whenever they wish with no evidence to their complaint. It is far too easy for them to just press a button and never think about the consequences of their action. If a seller or buyer or agent does not like the value, they can just file the complaint and walk away. This leaves the appraiser to go to the board and defend themselves. What happened to Frank Dodd? We are now scared to do our jobs because of threat of a complaint for value. This is so ridiculous. If the value is low, prove it with the complaint. Most people that file a complaint have no evidence to back up their claim. If there is no evidence, then the complaint needs to be thrown out right away. If you force these people to come to the board as well, they may stop filing these frivolous complaints. If it is very important to them to file the complaint, it should be just as important to follow through and be forced to attend the meeting. I am not certain how to bring about change, but it has to be done. We are loosing good appraisers and this is just making it more likely for others to leave. I am scared to do my job. I AGREE!! how can one fight a board? Oregon appraisers lost their most valuable asset when they lost Bob Keith as the Administrator of The Appraiser Licensure and Certification Board. His agency was by far the best run governmental agency in the state as he ran it in an open door manner that was fair to appraisers and yet fully protected people of the state (so unlike most state agencies). I would highly recommend his services and his expertise. Like many other long term appraisers, I have had it. I am exiting a once enjoyable business due to the limited ability to truly appraise, low pay and infinite liability. The entire execution of an Appraiser is unfair & everyone knows it yet nobody does crap! As stated in the story “most folks investigating appraisers have less knowledge than appraisers nor understand what appraisers do in the field”. Yet, the same ppl are destroying Appraisers Livlihood and getting away with it! My License was revoked in Ga by a Judge Oakly who had no clue about what i did as an appraiser! In court i gound out the investigators are not appraisers but “Took some classes” as was told to my Attorney during the hearing. The 1st day in which the board took all day against me and on day 2 in which we presented my side, Judge Oakly told my Attorney within the 1st 10 mins that he needs to SPEED UP! Her mind was already made up. The entire set-up is unfair and the GREAB extorts appraisers with unscrupulous FINES! Wished i had paid the $5000 fine instead of fighting against the system even though i knew i followed appraiser protocol. I tell appraisers to just pay the fine b/c you will LOSE trying to fight them! You cant fight ppl in positions to judge your work whem they have no knowledge of your work! since 2008. Isn’t that registering with anyone at the AI? All the more reason to leave this crazy business. USPAP has become “the bully on the playground”. Actually, it is the states being a bully through their misuse of USPAP and purely made up things that are not within USPAP. It’s like the phantom things underwrites love to say about being a FNMA/FHA guideline. I always tell them to send me a copy of that guideline and I will comply with it, however, the guideline does not exist and they can’t. 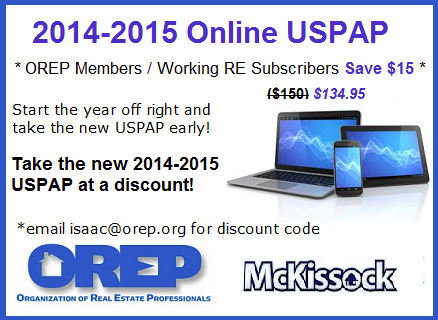 As I have heard from many USPAP instructors, USPAP can be usually be your best friend in cases like this. Thankfully, I have never had to deal with it in this manner.